Waynehead is a Canadian-American Saturday morning animated series created by American actor Damon Wayans. It was produced by Warner Bros. Animation and Nelvana, with animation by TMS-Kyokuchi Corporation (intro only), Hanho Heung-Up Co., Ltd., and PASI. It ran on Kids' WB from 1996–1997. 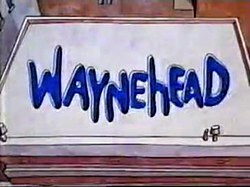 Waynehead lasted for only 13 episodes and has never been released on VHS or DVD. It is about a young boy named Damien "Damey" Wayne from a poor background with a club foot and was based on Wayans' own childhood in the Chelsea neighborhood in the New York City Borough of Manhattan. Actors cast in the show included Gary Coleman, Orlando Brown and Marlon Wayans. Damey digs for dirt when his battle with the school bully turns into a "dozens" fight, a contest of insults. Damey tries to earn money for the Harlem Week Festival. Damey learns the difference between friends and family when he sneaks out of the house to run with his gang. Damey's angry when he's forced to spend the day with the nerdy new kid, but when Aki is endangered by a run-in with the Hydrant of Doom, Damey sets out to rescue his unlikely friend. Waynehead's cousin Three Hats from Los Angeles comes to visit. Damey asks his dad to coach the gang for a game against the tough St. Mary's team, and soon realizes his dad's a disaster on the court. Roz falls for Damey when he rescues her from junkyard dogs. Damey's desperate to keep his opera role a secret from the guys, but circumstances conspire against him. Damey and his pals struggle to get Mom to the hospital when she goes into labor at the library. When Toof and Damey happen to find a firecracker the night before the 4th of July, the gang thinks they've got a secret source for illegal fireworks. Damey's torn when Marvin gives him a Ken Griffey, Jr. autographed glove with the money he stole from the gang. Damey helps a homeless DJ who works on his guilt over a prank they'd pulled just before the man was fired. Damey becomes convinced that the world is against Tripod because of his missing paw. ^ Perlmutter, David (4 May 2018). "The Encyclopedia of American Animated Television Shows". Rowman & Littlefield. Retrieved 8 September 2018 – via Google Books. ^ Hendershot, Heather (1 February 2004). "Nickelodeon Nation: The History, Politics, and Economics of America's Only TV Channel for Kids". NYU Press. Retrieved 5 September 2018 – via Google Books. ^ "Wayans Doesn't Believe Warner Bros". Retrieved 5 September 2018. This page was last edited on 25 March 2019, at 00:45 (UTC).